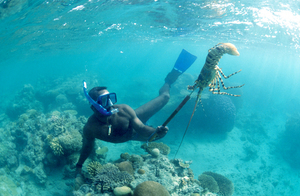 Staff from CSIRO Marine Research have developed a lobster population model for the Torres Strait rock lobster fishery. The model produced estimates of annual natural and fishing mortality rates, and quantified uncertainties in the relationship between sustainable yield and fishing effort. The outputs also included comprehensive evaluation of a broad range of management strategies for the lobster fishery.